Les chambres élégantes et fonctionnelles du Gran Ultonia disposent d'un éclairage doux et de parquet en bois massif. Elles sont toutes équipées d'un minibar, d'un coffre-fort et d'une salle de bains moderne et élégante qui comprend un sèche-cheveux et des articles de toilette. L'hôtel propose un petit-déjeuner buffet et vous trouverez aussi un bar où vous pouvez prendre une collation ou une boisson. 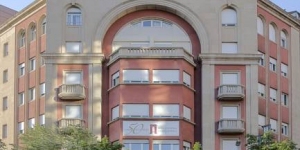 L'Hotel Gran Ultonia se trouve à 200 mètres de la Plaça Independencia qui compte de nombreux bars et restaurants. Le parc de la Devesa est situé à seulement 150 mètres et les gares ferroviaire et routière de Gérone sont accessibles en 15 minutes de marche. Le personnel de la réception ouverte 24h/24 de l'hôtel vous fournira de plus amples renseignements sur la ville. Un parking sécurisé est disponible sur place à un bon prix et les motos peuvent stationner gratuitement. No bath. No iron to borrow. Everything. It is very close to the old city and close to the train station. The staff were very helpful and the room was quite comfortable. Location, style, friendliness, food, price. Location close to everything. On Site parking. The hotel is just a short walk from the old town and there are plenty of restaurants within a few minutes walk. Staff were helpful and friendly and spoke excellent english. Lovely hotel. Would be nice to have cheaper parking and breakfast, but we were in a city after all! Apart from that, no complaints. The location within easy reach of the old town. The helpfulness of the staff. The confusion in the name of the hotel, the word Gran does not appear on the exterior of the building and it seemed from the booking that there were two separate hotels, one Gran and the other not! Overall an excellent hotel. We were there off season so the hotel was fairly quiet. A true four star experience, good breakfast with hot food, scram egg bacon and b beans as well as the usual continental offerings. Broadband was only 1.5 mbps, but sufficient for my needs. Hotel location is quite near a main railway line, but soundproofing worked well. Would certainly stay there again. Car park is very tight and our long wheel base estate grounded on some of the ramps. It's in a great location, easy to get to what you want to see. Nice and quiet too. Everything gets an excellent rating with this hotel. Particularly enjoyed the location a few minutes from the old centre and the beautiful Placa Independencia. 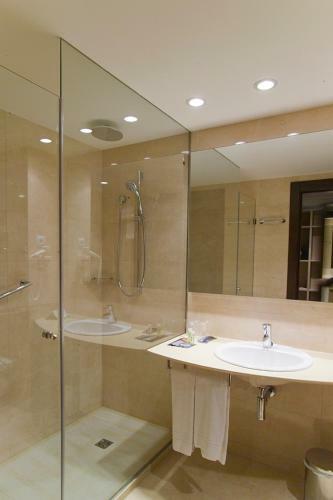 Should also make an extra comment about the cleanliness of the room and bathroom and the amazing 'rain shower'. Would always stay here for trips to Girona. The shower facilities were excellent, and the bedroom was clean. Excellent room. Large bed, good modern bathroom. A perfect location near the old city and squares with plenty of bars and restaurants. Spacious room, wonderful shower, quiet and comfortable. Secure parking with direct access to the hotel. We would definitely stay here again when visiting Girona. Friendly attentive staff. Very attractive accommodation. Difficult to find the underground parking. Location was fantastic, easy to get to the centre of the city. Room was very comfortable and clean. Breakfast was disappointing - no yogurts available even at 8.30am. Noise from trains not good. However would stay again and ask for room away from train station. This proved to be an excellent stay. The room was large and well appointed. It felt recently refurbished to a high standard. It was amazingly quiet.The staff were very friendly. 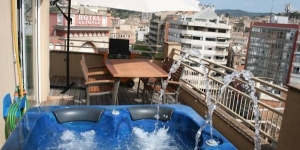 It is not too far from the station and very well placed for exploring the wonderful city of Gerona. We would recommend visiting Gerona and staying here. Nice room, great location, breakfast above spanish standard. Great location, clean and comfortable rooms, friendly and helpful staff and brilliant value for money. Car parking a little expensive. Location. Perfectly adequate room and big shower perfect for two. 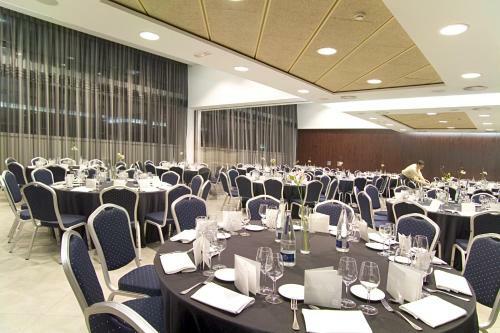 location, the general look of the hotel, excellent decor and an air of quality and luxury. In practical terms I thought nothing was missing. Not all bar staff up to scratch on the available cocktails ! The location was central and we needed somewhere with parking. We got a last minute deal for an excellent price which offset the cost of the parking. I hate to find anything wrong but the pillows were too big and we couldn't sleep til we put a couple on the floor. shortage of bread in continental breakfast, when the bread came, there was shortage of ham, when ham came there was shortage of cheese. Probably hotel was fully booked. Complicated wi-fi (a different and very long password for each device) but at least it was free. Location was fantastic - with easy access to shops & restaurants. Really good value for the price and locations of the hotel. Big rooms and sort of luxurious. Strong wifi. Excellent price. Very good shower. Central location, within walking distance of the train and bus station. No room service after 11.30pm, no tea or coffee making facilities in the room. Tried to charge for breakfast that we had not had. Very centrally located. If you are lucky you can find free parking spots behind the hotel. The staff didn't inform about the hotel parking when checking-in. The front-desk was also a bit rude. Instead of helping the queue of guests, the staffs just went on chatting for 10 minutes with one another. Bit noisy during the night due to pedestrians shouting. Nice room very clean maid service was good. Good location,nice city, felt very safe. Breakfast was cold. No english Tv Channels Car parking charge to high per night. Very spacious room and bathroom. Location was perfect. Very quiet at night even during the fiesta!! Would stay again if heading to Girona or Barcelona. It is exactly as described on the website. Great central location - close to the old town and close to plenty of good restaurants. Clean, spacious, modern room. Staff very friendly and helpful. Excellent location - handing for walking into the old town but with modern facilities. Rooms good with a special mention for very comfortable beds and fantastic large shower. Staff informative and helpful. Good rooms, clean spacious, great location close to Old town. A wedding reception in the hotel on Saturday night with an extremely loud Disco which carried on until 3.30am. We were on the third floor and were kept awake. Staff were not sympathetic. I had a wonderful stay in this great hotel in the wonderful city of Girona. The WiFi is very poor. Fantastic roof top terrace bar - great staff, rooms were excellent and location just off the old city was perfect. Very good value. Everything! Smart rooms, lovely shower, great location, friendly and efficient staff. Wonderful and very helpful staff. Highly recommend this hotel for a visit to Girona. ,Hermoso y confortable hotel ubicación privilegiada a contados metros del casco histórico. Excelente atención, habitaciones amplias y cómodas. Muy recomendable!! Helpfull and efficient front desk staff. excellent level of comfort in rooms which are very clean. Location very central. Breakfast was disappointing as no hot food replenishment without having to ask and then wait 10/15 minutes. Spacious, modern and comfortable, with it's own car parking underground. Close to restaurants and nearby bridges over the river to the old town with its tourist attractions. Noise from the rooftop bar above our room continued into the early hours. The staff was friendly and efficient, the hotel is modern and clean and the rooms spacious. It is very well located too. If anything, the entrance to the garage was quite difficult to find without instructions, so if you are coming to the hotel by car and this is your first visit, it is better to give them a call prior to arrival and ask for instructions. Great hotel with really friendly staff. Always happy to help and advised on how to get around. Free wifi for a day too. Breakfast was what you'd expect, good food, full bean coffee. Girona is a lovely city but you have to travel around quite a bit to find things to do. We saw all the sites In girona in 1 day and spent other days getting trains or busses. Saying that its only 40 minutes on the train to barca. And don't get my wrong its a lovely place with some brilliant resturants and it has a lovely charm. Ideal for a couple. Easy walk to historical town, some good tapas places right around corner, room ready, modern and comfortable by noon and staff helpful. The only area for smokers was outside the front of the building on the main street. As a woman travelling on my own I wasn't so comfortable with this. Bedroom excellent. Bathroom superb. Very clean and well run. Good central location with easy access to all local sites as well as bus/rail station. The hotel was in excellent postion for access to both old and new towns.The hotel was only about 15min walk to bus and train stations. Lots of places to eat nearby. Not enough english channels on tv. No coffee and tea facilities. Clean, very central location two minutes from great restaurants and shopping, quiet, good value. 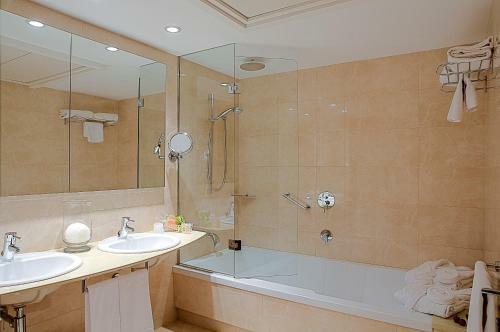 Modern hotel, large bathroom and very clean. Staff were friendly and helpful. Location was good. Walking distance to old town and approx. 10 mins away from the 'mercado'. Parking available below the hotel. The reception desk was very efficient and all staff spoke excellent English which put my poor Spanish to shame. Rooms were lovely especially walk in shower. Car parking reasonable and secure. Staff and quality of the room and experience. 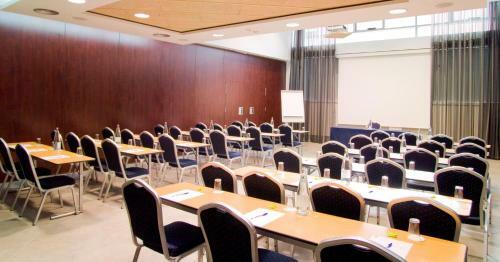 Location of the hotel is great - easy walking distance to old town and all major attractions. Pet friendly. Convenient location with pet friendly facility. It was a very good hotel, very close the historic town. A fitness gym would be a bonus. Everything was excellent in this very modern hotel. Good value for money. The room is very well appointed. Free Wifi. Very friendly and competent staff. The hotel bar (/restaurant) is a bit limited in both range of items and opening times. There are many other restaurants around (I'd recommend Koenig across the street) but that lacks the convenience of having a restaurant in-house. Service and location were both excelent. Great place for a weekend escape. Shining clean especially the bath. The Hotel was oviously recently renovated so everything was perfect and looked fresh out of the box. The staff was friendly and professional. We only stayed for one night so there was not something that we did no like. Everything! The young people at the desk were so kind and helpful. Close to everything. beautiful hotel. Breakfast buffet a bit expensive. I really liked the reception staff, there professionalism and helpfulness. They made you feel welcome and that they were there to help you. The ambience of the eating areas. Excellent breakfast. Secure bicycle park and washing facility. Friendly English speaking staff. Quiet for inner city location. The Ultonia seems to square the circle: staff who combine professionalism with friendliness; surroundings that are impressive but comfortable; we look forward to our next visit. Grácias.